This article was sponsored by Syncano. Thank you for supporting the sponsors who make SitePoint possible. 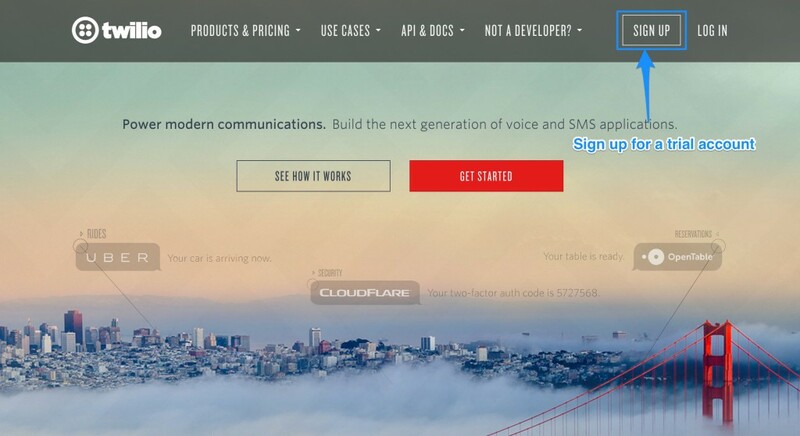 Syncano provides a cloud-based platform for real-time applications. It stores the data, microservice code, schedules for automating code execution, user accounts, webhooks to access these functions via HTTP and more. They’ve even got an open source community of code snippets and support various runtime environments including Node, Python, Go and Ruby. From a developer point of view, Syncano makes it simpler to get started by providing a lot of the backend infrastructure you’d otherwise need to piece together yourself. In this article, we will look at what is involved in setting up a web app using Syncano and linking it to third party services. 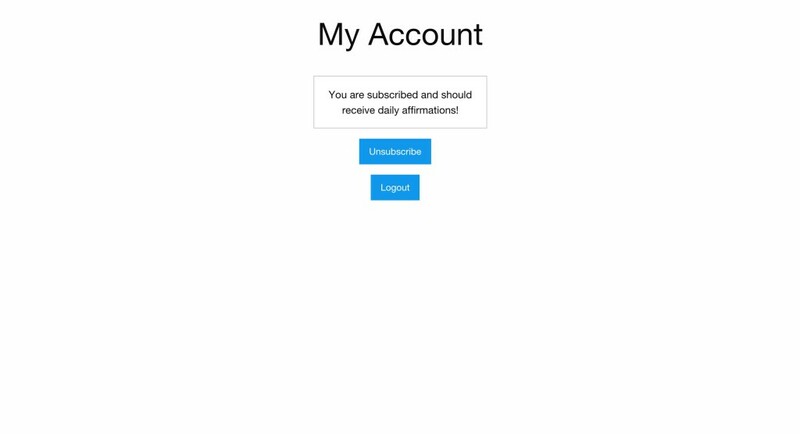 To explore what is possible with Syncano from a beginner’s perspective, we’ll be putting together a web app that will send registered users positive affirmations each day for the low price of $1 a month! We’ll explore user registrations, scheduling events, sending out SMS messages via Twilio and setting up payments. The code for this demo can all be found on GitHub. Description – the description for your API key. We will call ours “Affirmations”. Ignore ACL – this ignores any permissions set for resources within our app, we won’t need that. 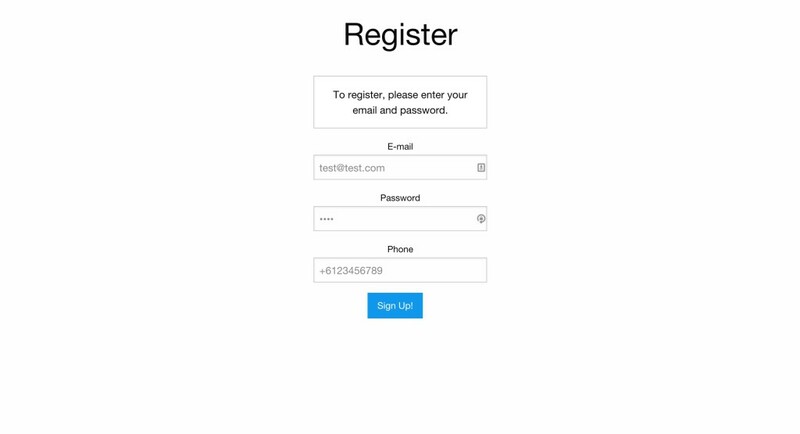 User registration – this lets people sign up within this API key, we will want to have this ticked! 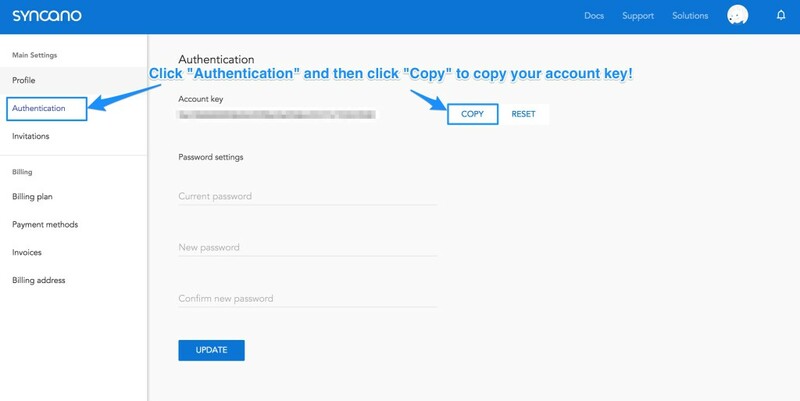 From there, we click the “Authentication” item in the menu on the left and click “Copy” to copy the Account key that is displayed. Store that somewhere safe for now! We will want to try and stick to using the API key where possible, especially anywhere that is outside the Syncano ecosystem. We will also be able to see our users listed on the “Users” page once we’ve got a user in the system. 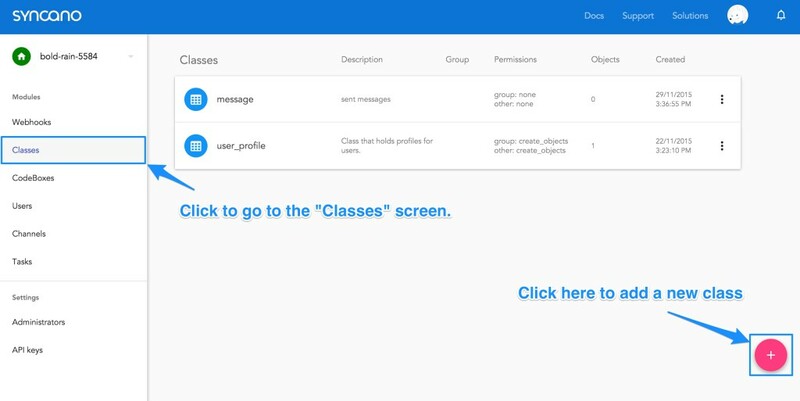 The “User” page will show their e-mail addresses and whether they are assigned to any groups (we won’t be assigning groups in this demo), the “Classes” page with the user_profile class will show us much more detail, including custom fields we will be adding for our app in particular. 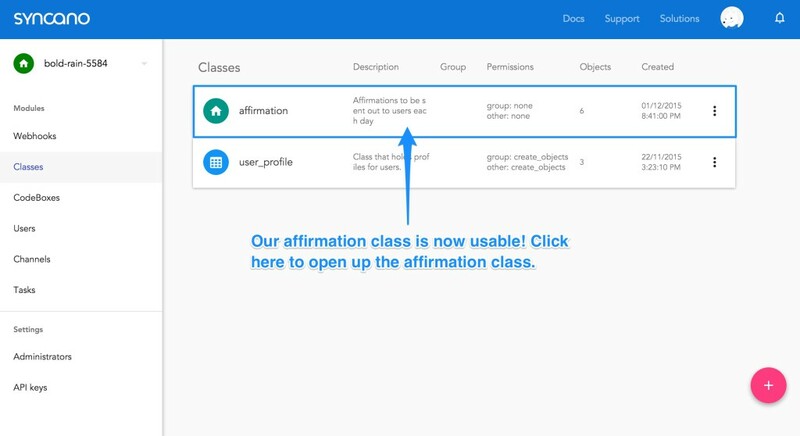 In this screen, we name the class “Affirmation” and give it a description. 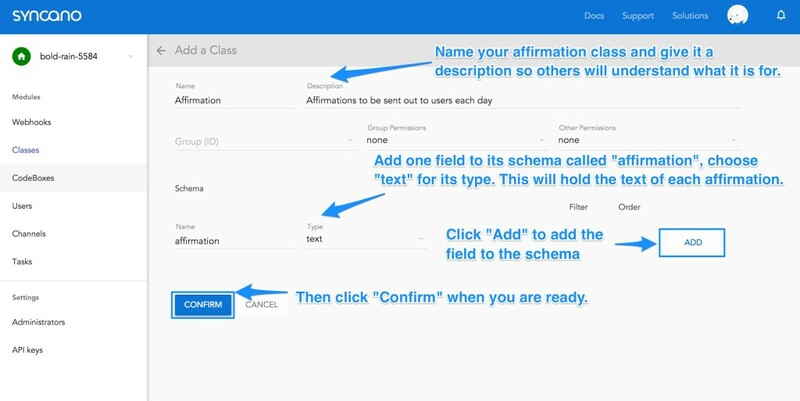 Underneath “Schema”, we set up our single field for the class which we’ve also called “affirmation”. We set it to be a text field and click “Add”. Then we click “Confirm” to save the new class. Make sure you click both “Add” and “Confirm” for it to save everything! 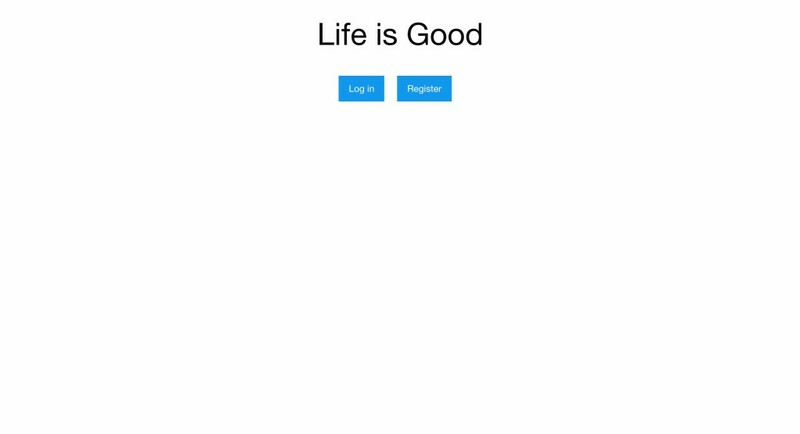 The main feature of our app is that it will send out a daily SMS to users with a positive and happy affirmation. 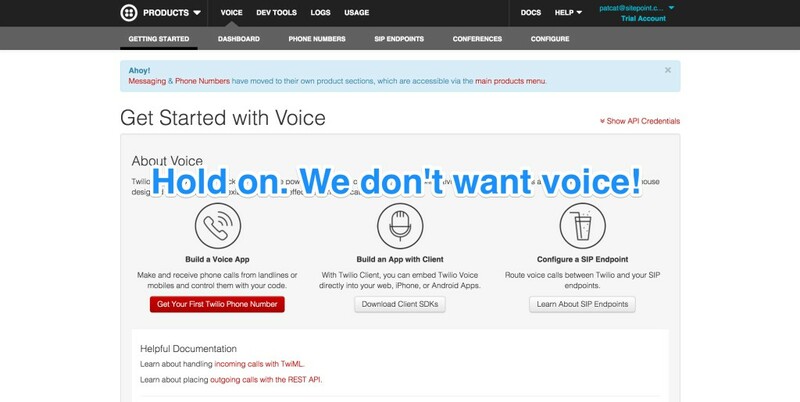 We will be sending these SMS messages with Twilio – a service that provides voice and SMS services. 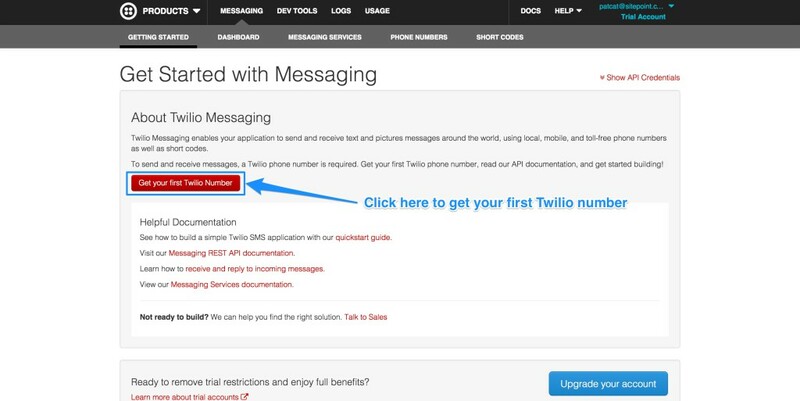 Head over to Twilio and click the “Sign up” button in the top right to sign up for a free trial. If the next screen shows a number with SMS as one of its capabilities, go right ahead and click “Choose this number”. 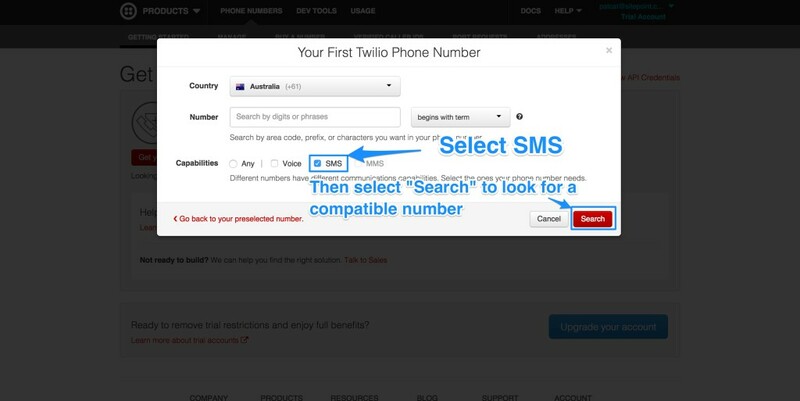 Twilio will now show you your Twilio number! Copy that number somewhere safe as we will be using that quite soon. 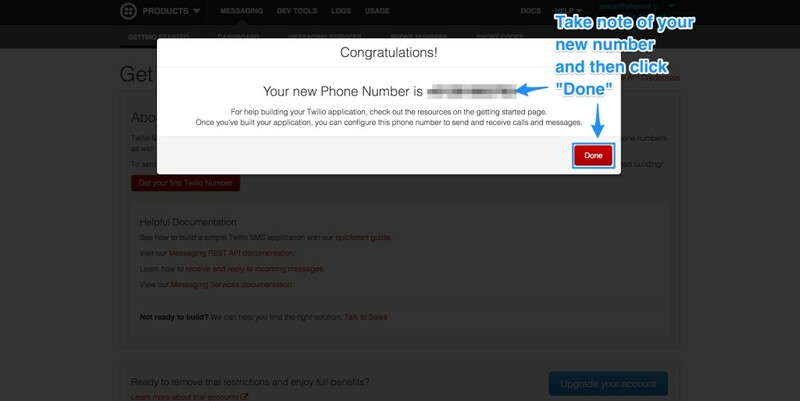 On the Twilio “Getting Started” screen for Messaging, there is one last piece of information that we will need for our app – our Twilio API credentials. 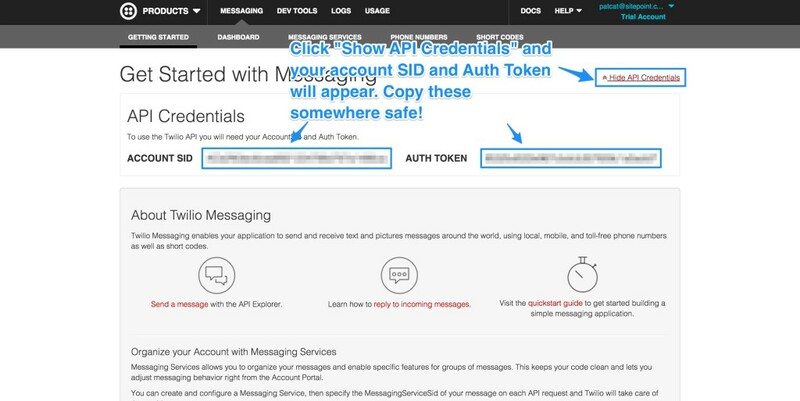 To find these, click the “Show API Credentials” link in the top right corner. You’ll then see your “Account SID” and “Auth Token”. Copy these somewhere safe (preferably the same place as you copied the phone number). We will use them in our app soon too. 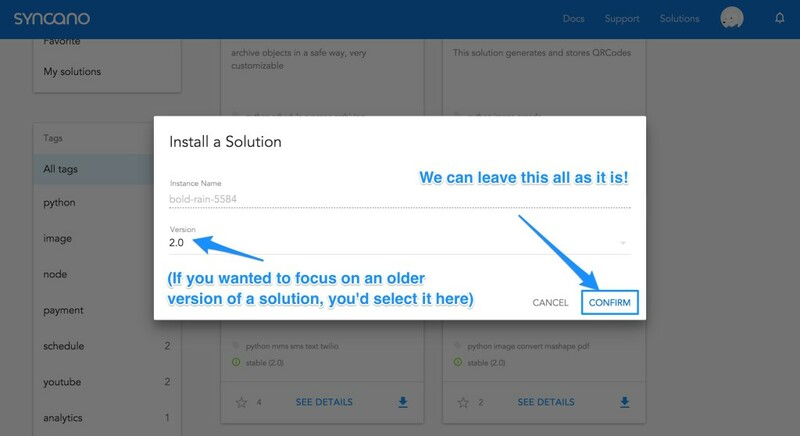 One of the really nice features of Syncano is its open source repository of Solutions that you can add into your projects with a few clicks. The Solutions don’t even need to be written in the same language as the rest of your app! They’ll add in everything you need for the functionality to work and you just need to provide specifics for your application’s needs. 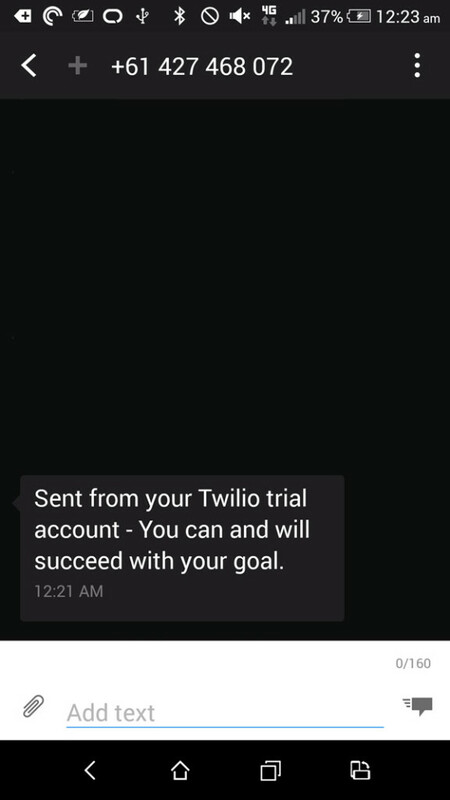 Sending SMS messages using Twilio is unbelievably easy because there’s already a Syncano Solution ready to go called “Send SMS”. 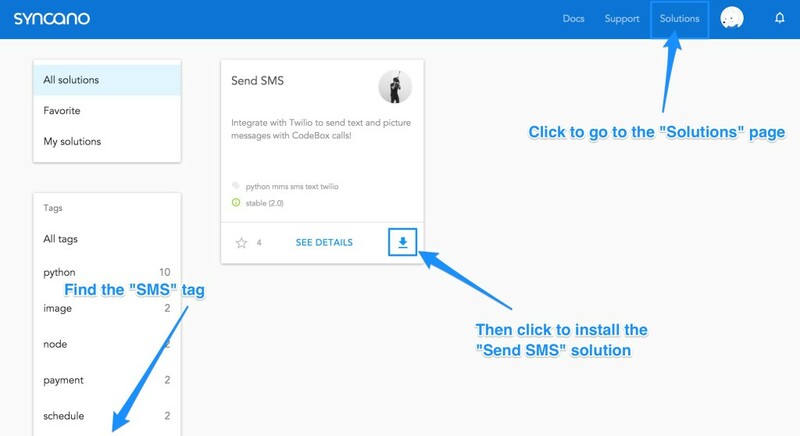 To install our “Send SMS” Solution, we click on the “Solutions” link in the top right, then find the “SMS” tag on the left to filter them. It is much easier to find the “Send SMS” solution this way! Once we have it, click the arrow icon on the bottom right of its box to install it. 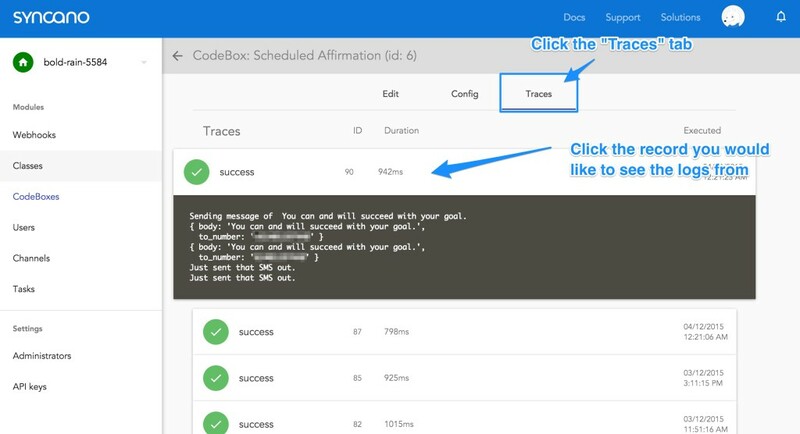 Each code snippet we can run in our Syncano hosted application is called a “CodeBox”. Ready made CodeBoxes will appear as a part of Solutions and you can also make your own. We will be doing both in this guide! 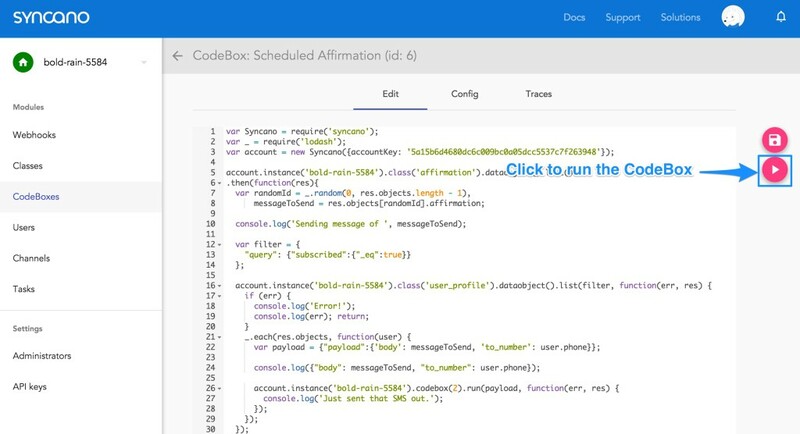 If we click the “CodeBoxes” menu link, we find the “Send SMS” solution has created us a CodeBox called “sendsms”. The icon beside it tells us the CodeBox is written in Python. Luckily, as I mentioned earlier, we can have components written in different languages working together. 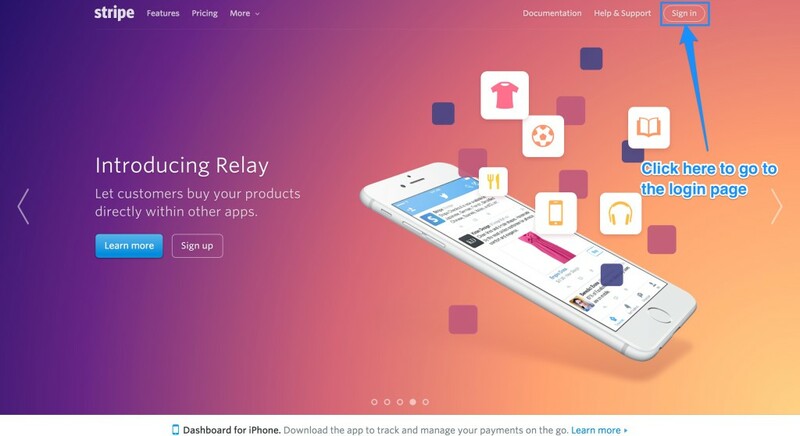 This is a really fascinating way to work on and share functionality! SYNCANO_API_KEY – Update this to your Syncano API key we copied earlier. ENTER_INSTANCE_NAME_HERE – Update this to your Syncano instance name (e.g. bold-rain–1234). ENTER_YOUR_ACCOUNT_SID_HERE – Update this to your Twilio Account SID. 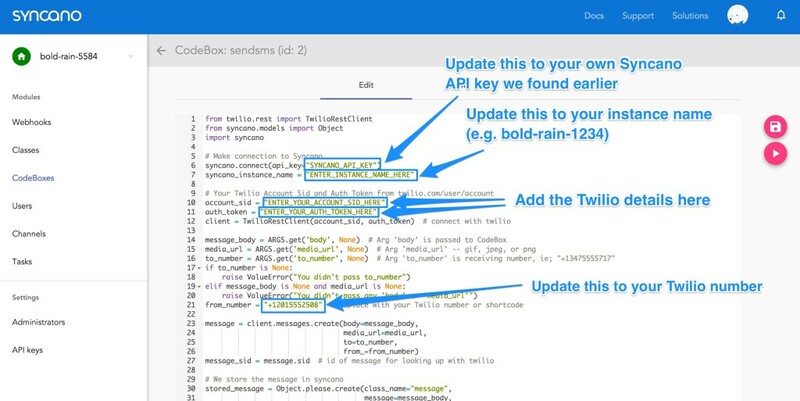 ENTER_YOUR_AUTH_TOKEN_HERE – Update this to your Twilio auth token. 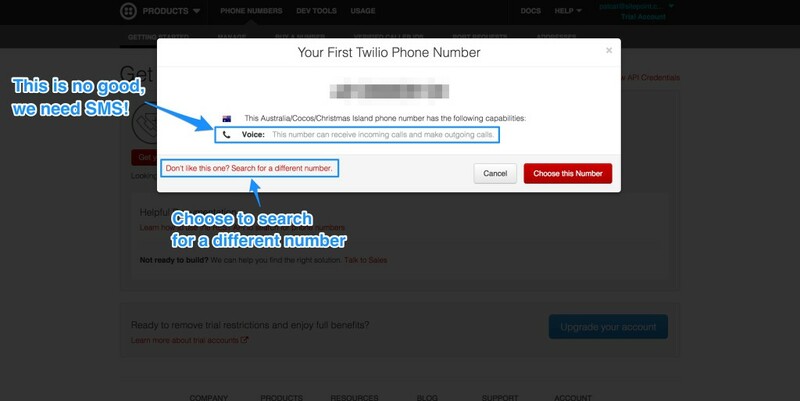 from_number – This variable needs to be equal to your Twilio phone number you chose earlier. to_number = ARGS.get('to_number', None)  # Arg 'to_number' is receiving number, ie; "+13475555717"
In order to run this for each of our users, we will create our own CodeBox that will trigger the sendsms CodeBox with our user details and an affirmation for the message body. 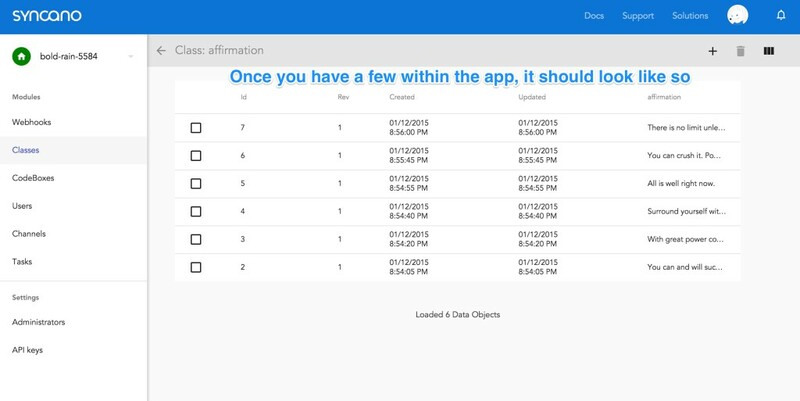 The first thing we do is get a random number using lodash that is between zero and the number of affirmations we have (minus one because we are starting at zero). This is how we choose our random affirmation. We then choose that affirmation by assigning the affirmation object at that random ID to the variable messageToSend. In order to send out the random affirmation to our users, we need to list them all first. 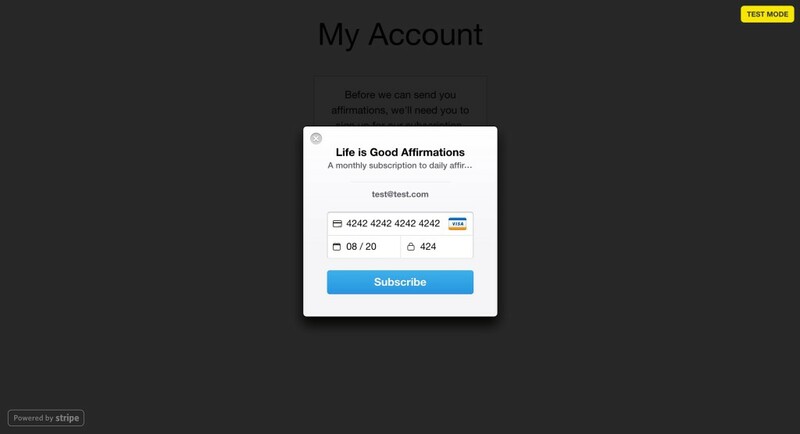 Remember, we only want to send this to users who have subscribed to our affirmation service through Stripe. 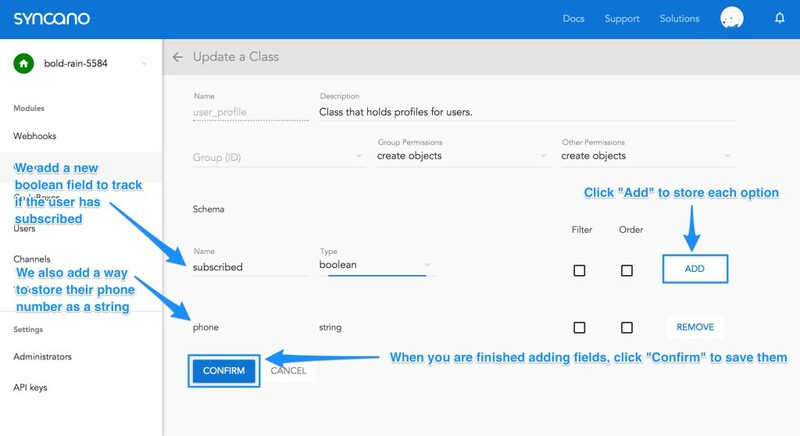 We don’t have the Stripe service set up just yet but the way we will keep track of whether users have subscribed is by toggling a custom value in our user_profile class called subscribed (we will set that up soon too). // We will look into our users in the res.objects variable here next! In the user_profile class list, we first check for any errors. Feel free to add this same error checking in the affirmation class list too if you’d like to be thorough. It is good practice to always be catching errors! If we have no errors, then we use lodash to loop through each user and put together a JSON with the messageToSend (our affirmation) and the phone number it finds for the user at this iteration of the loop via user.phone. 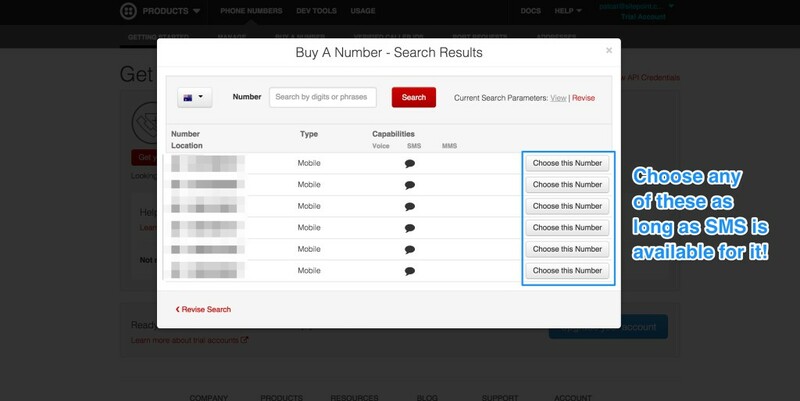 We’ll be setting up that custom phone field soon too. 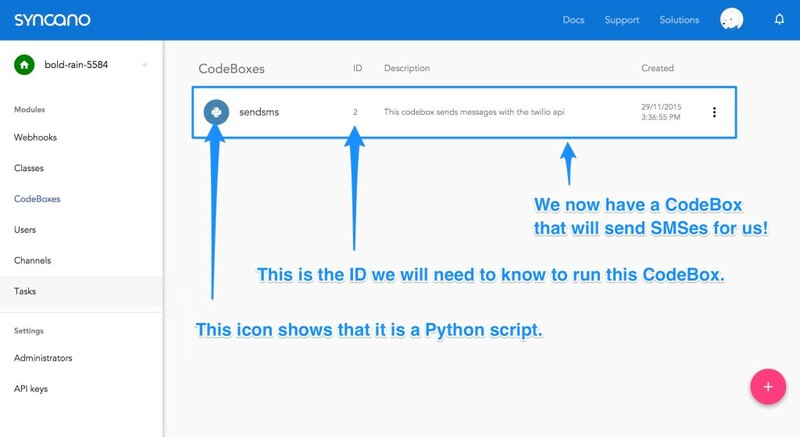 Finally, we run our sendsms codebox via the codebox(2).run() function. The 2 is our CodeBox’s ID that we took note of earlier. Once it has finished running, it logs a message to the console to let us know it ran successfully. We now need to add those custom fields to our user details for our app to be able to have all the information it needs to send users SMS messages. 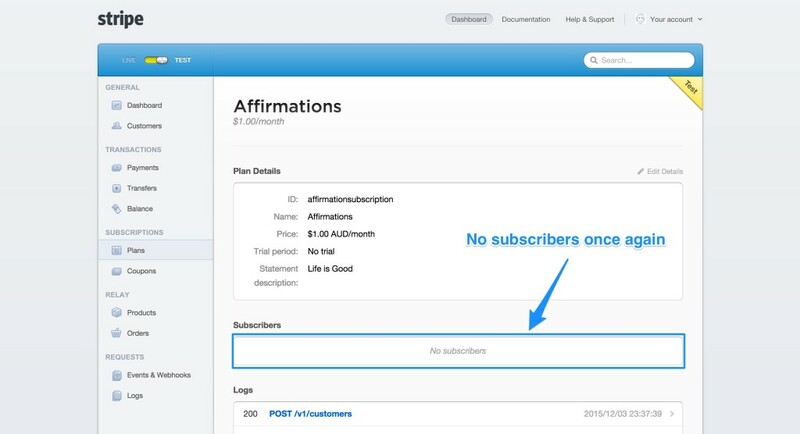 subscribed – A boolean to track whether or not the user has a paid subscription to our service (the paid bit we’ll integrate in soon). 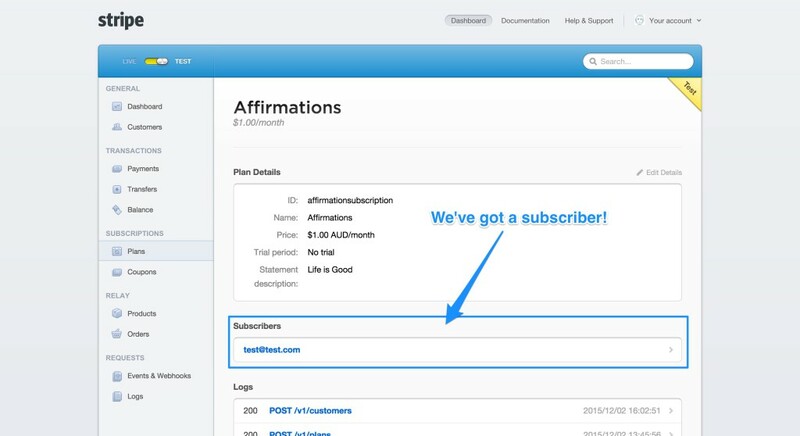 We only want to send our paid subscribers the affirmations! phone – A string to store each user’s phone number. We’ll need that to know where to SMS their messages. We will add each one by typing in its name, setting the appropriate type and then finishing the field by clicking “Add”. Once you have both fields added (make sure you’ve clicked “Add”! ), then click “Confirm” at the bottom of the screen to save these updates. To keep things simple in our HTML, we’re going to work off Foundation’s framework template. You can download that from the Foundation download page. If you aren’t a fan of Foundation or prefer a different framework – that’s totally okay. We are only using the framework as a starting point and a simple template for forms and such. You could do the same thing in your preferred template (or from scratch!) if you desire. This is just to avoid our prototype looking like it was built in the default HTML style of the ’90s. In HTML code samples, I’ll steer clear of the Foundation markup, but be aware that this is what is making things look a bit nicer than the default! If you’d like to see the Foundation framework version, feel free to look through the GitHub of our demo. We then refer to that instance via the instance variable whenever we need to access it. The final line of our code for registering or logging in users (both code snippets are very similar) is where the action actually begins. The registration code below looks up the user and logs them in via Syncano. If Syncano returns no errors, then it runs our callback() function that tells our front end everything is a-okay. As an example of how to make a basic Webhook, we will create the Webhook mentioned above that saves a user’s phone number to their account. A Webhook in Syncano is a way of running CodeBoxes via a HTTP request. It can be either a public request or one that requires authentication first. Our Webhooks will be publicly accessible via POST requests. 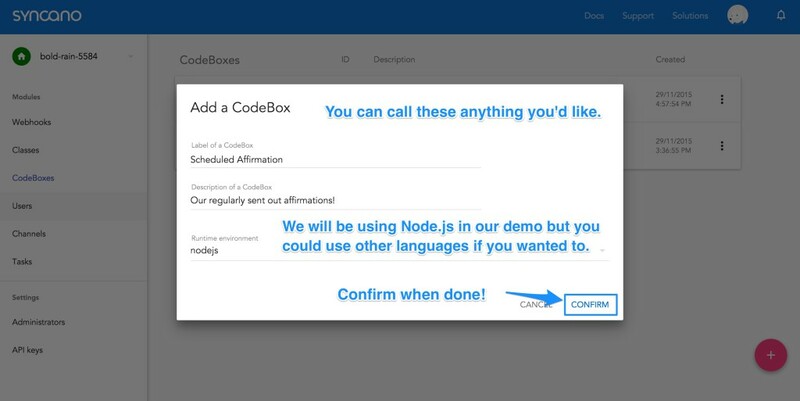 To create a webhook in the Syncano Dashboard for this CodeBox, go to the “Webhooks” menu item. 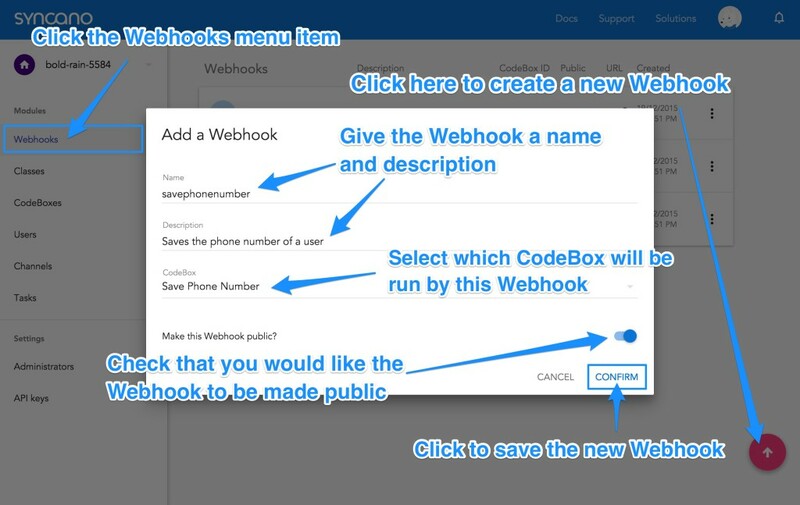 On the “Webhooks” page, click the arrow icon on the bottom right hand side to open the “Add a Webhook” window. From here, name your Webhook a URL friendly name, give it a description if you’d like and choose which CodeBox you would like it to run. Make sure you check “Make this Webhook public?” so that you can access the Webhook via POST requests. We’ve got user accounts set up, a list of affirmations and code ready to send out those affirmations via SMS. Now we just need a way for these users to subscribe and pay us to get these daily affirmations! To keep things simple, we will be using Stripe, an online payment provider. From here, we need to find and copy our API key for Stripe. This can be found in your account settings. Click on “Your account” in the top right corner and then click “Account Settings”. 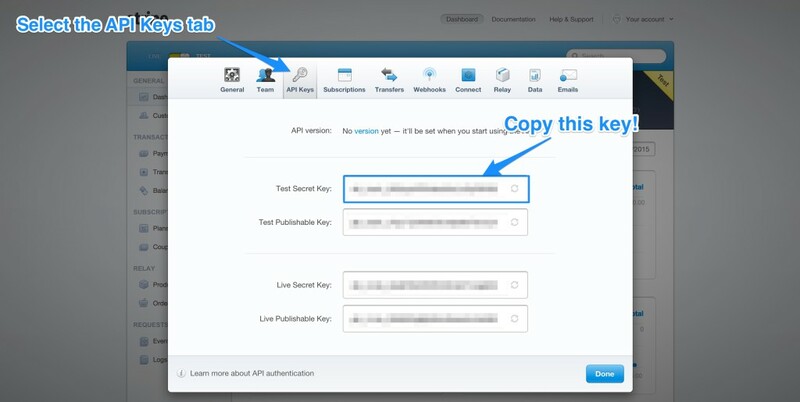 Then click on the “API keys” tab and copy the key that is beside “Test Secret Key”. This is the one we need to access our Stripe test environment. Copy it somewhere safe, ready to use in a CodeBox soon. Syncano does currently have a Stripe solution in its “Solutions” collection, however it is only for single transactions. We could potentially use it with a scheduled task but this could get messy as we would need to run that task at the same time for everyone. What if someone joins just before our next scheduled run? Do we only charge them once the task comes around? Instead, we eliminate all of this in a much nicer way. 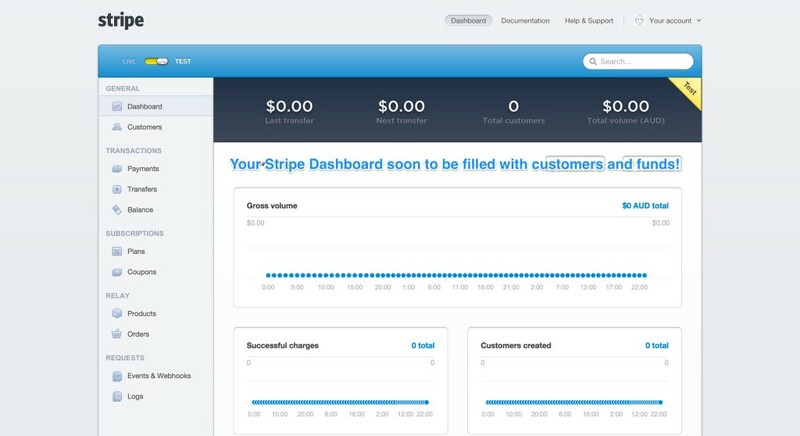 Stripe already has a subscription-based payment service. Syncano can subscribe users to that and then Stripe takes care of the monthly payments for us. All our system in Syncano needs to manage is whether they’re subscribed. Much easier! Currency – I left it in AUD but you might want it in your local currency! Trial period days – We aren’t providing a free trial period but you could do so here if you wanted to. 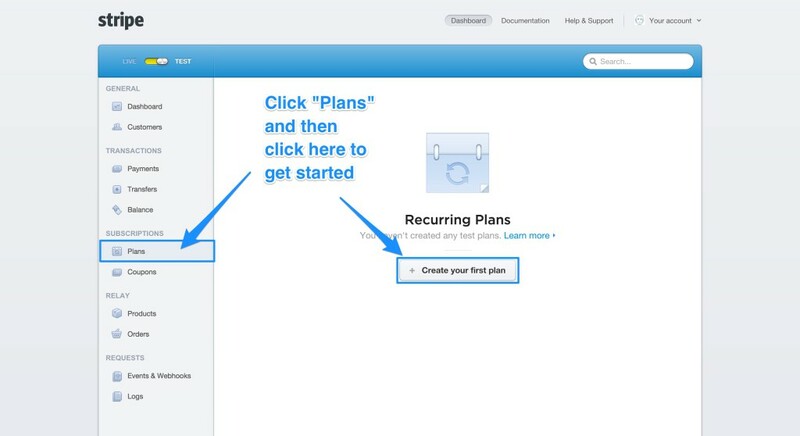 Then we click “Create plan”. With that, our set up on the Stripe side is complete. // Our callback function will be here! In our callback function, we list our users and update the fields of the user with the same email in our database. 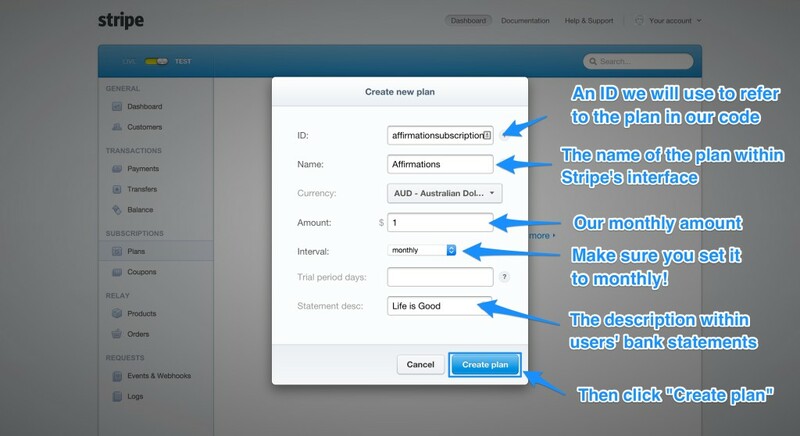 We save their Stripe ID (each user in Stripe will have a unique ID that we can use to manage them in the future) and their subscription ID (Stripe also gives each subscription its own ID so we can manage that too). We also set subscribed to true for them so we know they should receive affirmation SMS messages. I’ve found it useful to include a console.log in the callback. This logs the two Stripe IDs while testing, to ensure the right ones are coming through. To have access to that CodeBox, create a Webhook called subscribecustomer in Syncano that runs it (create it in the same way as the Webhook we created above). We will use that soon. Stripe knows about our subscription service, Syncano knows how to subscribe us via Stripe. The one remaining piece of the puzzle is a button for the user to click that starts the whole process of subscription. We start the process via Stripe’s Checkout service. 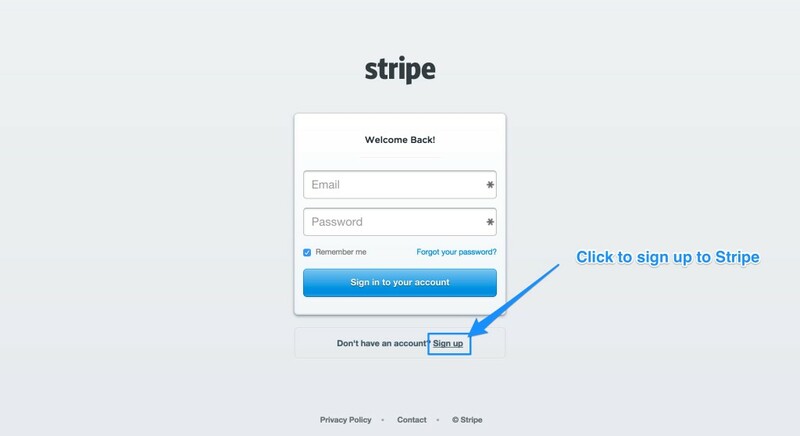 We will be creating a custom Stripe Checkout button. This button doesn’t actually do the subscribing. It can be used to make payments, however we’ll be using it solely to get the user’s credit card details and email into Stripe initially. It needs these before it will let us subscribe them to our plan. When Stripe has the user’s details, the token function runs and we send the token and email to our Syncano Webhook called subscribecustomer. This passes them onto our CodeBox for use in our actual subscription process. 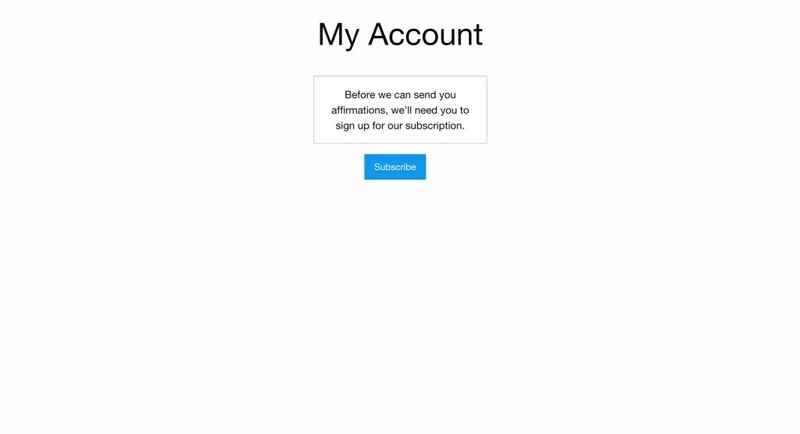 To unsubscribe customers, we do a shortened version of the subscription process. We do not need Stripe to initially get the customer’s details or anything along those lines because we’ve already got their Stripe ID and Stripe subscription ID. Instead, all we need is a CodeBox that can take these details and tell Stripe to unsubscribe this user from this subscription. We will create a CodeBox called “Stripe Unsubscribe Customer”. In our “Stripe Unsubscribe Customer” CodeBox, we have the same sorts of require statements as the “Stripe Subscribe Customer” CodeBox. We take in the current user’s Syncano ID as well as their Stripe IDs so that we can change their listing on our end too to set subscribed to false and remove their subscription ID from our database. The only bit in this CodeBox that might look different from what we’ve already done is stripe.customers.cancelSubscription() which is our call to Stripe to cancel this user’s subscription. We pass in the Stripe ID and Stripe subscription ID, then in the success callback, we make the changes to our own database. 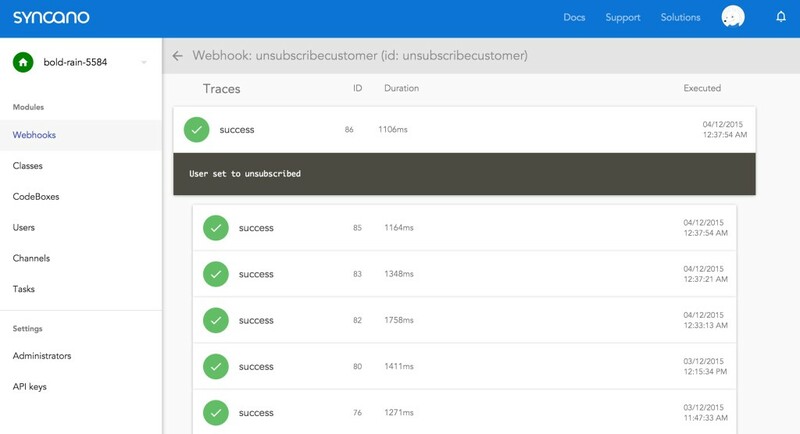 Create a Webhook called “unsubscribecustomer”, trigger it via the same methods as our “subscribecustomer” Webhook and your subscription settings are complete! The last thing we need to get running now that we can accept customers, is our scheduled affirmations. 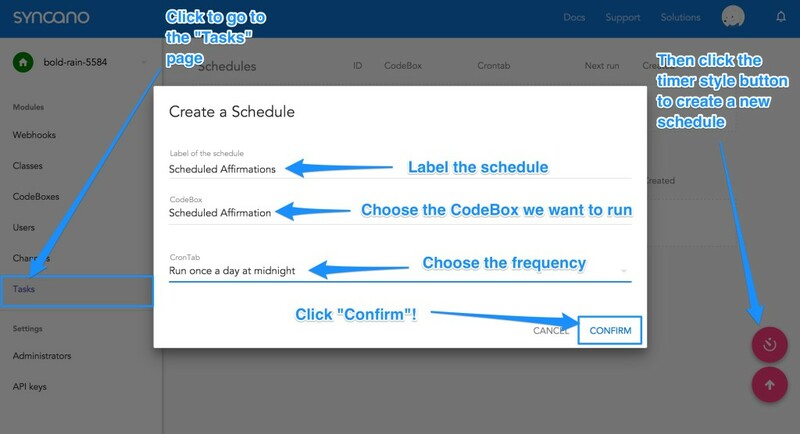 We have our CodeBox called “Scheduled Affirmation” ready to go, we just need to set it onto a timer. Go to the “Tasks” page, click on the round button with an icon that looks a little bit like a timer in the bottom right hand corner. In the pop up that appears, choose a name for your schedule, select the “Scheduled Affirmation” as the CodeBox we want to schedule and choose how often you want it to run (it appears at the moment, once a day at midnight is our only option – there is yet to be a way to set the timezones, so this won’t be midnight for everyone!). Click “Confirm” and your schedule is set to run on its own! On a live site, you will want to have this app running via HTTPS as you are collecting very sensitive information! When we click “Subscribe”, the Stripe Checkout pop up appears requesting payment details. One of Stripe’s testing credit card numbers is 4242 4242 4242 4242, which is what I’ve used below. You can find a list of more Stripe test numbers and such here. If we go to our Stripe dashboard, click Plans and then our Affirmation plan, we can see details about the plan. In particular, we can see our new subscriber! Syncano is a platform which can make the task of putting together an app a whole lot faster and smoother to manage. Its concept of CodeBoxes and Solutions also encourages the separation of tasks into smaller chunks which can keep things neat and reusable. If you’ve got a prototype app you are considering building, why not try throwing it into Syncano and giving it a go?